I really have no idea if/when I will be finishing "Love Yourself", but I do have a vague plan to do so eventually. I haven't written anything in such a long time that I'm concerned I'm too far detached from my previous writing style and ability. We shall see though. I'll probably be focusing on challenge prompts to ease myself back into the fanfiction world for a while. 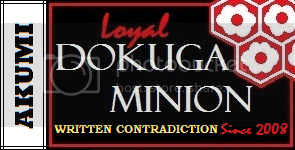 ^.^ I'm glad to be once again a Dokuga Minion. Sometimes love isn't enough to make a person stay. Sometimes, pain is the only way to grow. Love happens everyday, and in so many different ways. Unconnected drabbles/oneshots for challenge prompts. Some days just don't go well. Response to Public Transportation challange. I know you haven't been in a while and it's been like five years since you updated but and update for Love Yourself would be wonderful. I know that maybe you just don't feel you can but the story felt so real, it made the characters feel real, sympathetic. If you can one day, I'd love to see another update for the fic. Please Please please pick this story back up, I have been checking on it every week for almost 4 years now and I just cant keep going on not knowing how you will go with the rest of the story. Feedback from Akumi: Oh wow, this made my day! I'm so happy that you enjoyed my story enough to do so! Truly. I'm not sure when I will be updating "Love Yourself" honestly, but I do have a few ideas floating around in my spiderweb infested brain yet. It has just been so long since I've written ANYTHING, years really, and it'll take a little more time to reconnect to the emotions and character of that story. Not to mention regain my writing ability. Again, thank you so much for still loving it as much as you do!! It's extra incentive to get the ball rolling and start writing again! Hopefully I wont let your dedication to "Love Yourself" down! Please do continue your story 'Love Yourself'. It is so very good. Where art thou, fair maiden? Seriously, haven't sen you around in ages...everything alright? Was it you Akumi?? When is your birthday?!?!?! When i first came here there was someone who had the same b-day as me but i couldt figure out who! I asked and asked but no one was it! I love you and miss you! I hope everything is going well!!! Thank you so much for the glowing review of My Only. I'm glad you liked where I left it off. A lot of people were pissed. 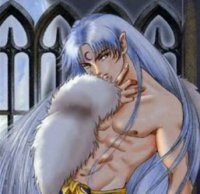 And I'm one of those who want a Sess/Kag but can't make Inuyasha into the bad guy. After all, he is the reason I found Sesshoumaru! Glad Kanna's 'Sock Puppet' rant gave you laugh! Thanks for reading and reviewing! Luff you. ^^ Happy holidays!